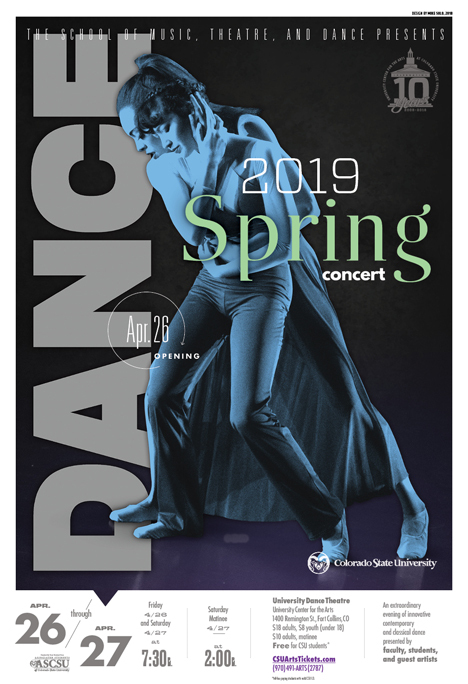 — Innovation is alive at CSU dance! This diverse concert features new works by faculty, guest, and student choreographers. Come be inspired by the versatility, athleticism, and expressiveness of our performers. TICKETING FEES: A $1 per ticket handling fee will be added to all orders. A $3 per order fee will be added for all phone and 'at the door' purchases. You can avoid the $3 order fee by purchasing your tickets online. RESERVED SEATING EVENT: Seating begins 30 minutes prior to curtain. Patrons arriving after the start of the performance will be admitted at an appropriate interval and may be required to sit at the rear or sides of the theater. TICKETS WILL NOT BE REFUNDED OR EXCHANGED. CSU STUDENTS: Skip the lines and use your RAMCard right at the door for general admission seating in designated areas (based on availability). To obtain a specific seat location you must reserve your ticket in advance. Students wishing to sit together must make their reservations together in person at the box office. TICKETS CANNOT BE EXCHANGED FOR A DIFFERENT SEAT. As events sell out should you find that you cannot attend a ticketed performance please contact the box office to release your seat so that other students may attend. ADDITIONAL INFORMATION: The UCA Ticket Office is open 60 minutes prior to curtain time for 'in person' sales only and remains open until 30 minutes after the performance begins.